Typical startup costs for wholesale cannabis cultivation businesses launched in the last three years amount to $42 per square foot, according to data in the newly released Marijuana Business Factbook 2017. But actual startup costs can vary widely based on the market each wholesaler serves and – to an even greater extent – the cultivation method used to grow marijuana. 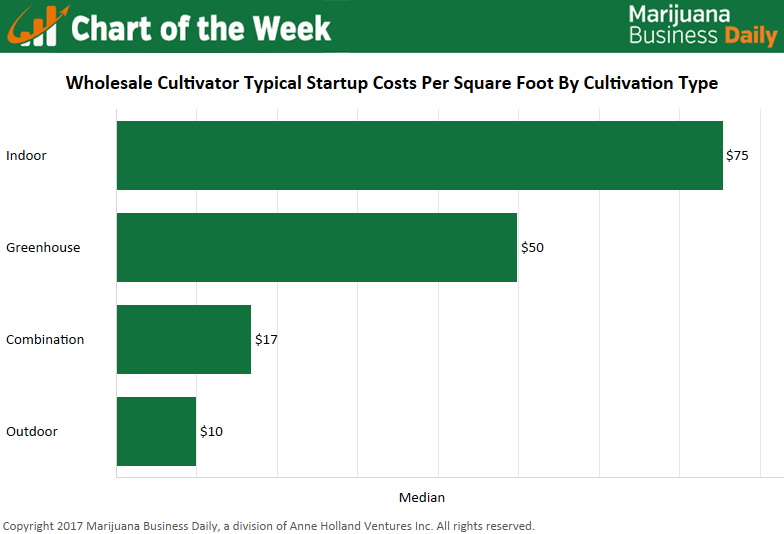 Cultivators with indoor grow operations reported significantly higher startup costs per square foot relative to that of greenhouse, outdoor and combination cultivation types – a reflection of the large upfront expenditures required of those businesses before growing can even begin. Because indoor cultivators need to artificially control all aspects of the growing environment, they must bear steep costs for equipment like temperature and humidity control systems and artificial lighting sources. Many states with heavily regulated MMJ programs – such as Illinois and Connecticut – mandate indoor cultivation, which further drives up startup costs for this type of operation. It’s important to note, however, that this data includes startup costs for cultivators across many states and markets – where unique regulatory environments can have a big impact on the amount of funding needed to get a business off the ground. In unregulated markets like California – where cultivators operate under a patchwork of local rules or, in some cases, none at all – startup costs are less than half that of growers operating in regulated medical or recreational markets. This, in turn, drives down startup costs for the industry as a whole. Traditionally, indoor growers have offset steep startup costs through their ability to produce superior flower – which fetches a higher price at retail – multiple times a year. However, greenhouse facilities have become more sophisticated technologically, allowing for multiple harvests per year and a degree of environmental control similar to that of indoor grows – resulting in high-quality flower that can be produced more cheaply and at much higher volumes. Both new market entrants and existing businesses seeking to expand are increasingly turning to greenhouse operations, building out sprawling facilities that cost more than the typical indoor facility in terms of total startup expenditures but, on a square-footage basis, are more economical. The expansive size of outdoor grows and their reliance on natural soil, lighting and weather conditions means outdoor cultivators have relatively few infrastructure needs. They are able to get off the ground quickly and with minimal upfront expenditures. Revenue per square foot, however, is much lower for outdoor cultivators because the price of “sun-grown” marijuana tends to fall below that of indoor or greenhouse-grown flower, according to the Factbook. The cultivation data is based on a survey of executives in the industry. With the falling price of wholesale cannabis, cultivators of all types are seeking better, more efficient ways to produce quality marijuana on a consistent basis. 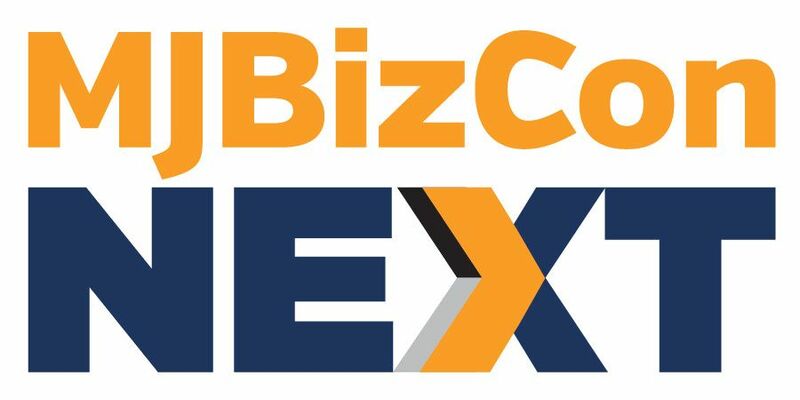 And that will undoubtedly have an effect on startup costs moving forward as businesses adapt to the rapidly changing dynamics of the cannabis industry. These numbers look to be somewhat out of kilter as I have been engaged in several startups in various states that were well in excess of those numbers for both indoor as well as greenhouse … perhaps if you were to specify what constitutes ‘startup’ expense? Efficient spenders who already own property and are hands on can easily start up a greenhouse operation for under $12.50/sq foot. The numbers posted here are for the modern day “venture capitalist” who don’t actually do anything but put the money up front, hire people and walk around and look at their project. With all due respect, 80 -90 % of the commercial cannabis industry is going to be about recombined distillates. This radically changes the market paradigm. I can produce cannabis for high grade extractions in Puerto Rico for about a dime on the dollar of what can be done anywhere, indoors or out, in the contiguous 48 states. M. Wolf Segal – I am interested in your Puerto Rico cultivation experience, as I am looking at relocating there from the states. Would you mind communicating though email? True Nuff not to mention the Profit margin at 600% is AWESOME EVEN WITH WEED A NEW ALL TIME LOW BIGTIME !! I am also interested in your Puerto Rico experience. Can you email me as well? Typically I’m a big fan of MJBiz Daily articles but this data seems incredibly ambiguous. How was this information gathered? What size was the sampling? What startup ‘costs’ are included in this chart? Surely these costs don’t include labor, leasing (in Denver we’re paying $16/sf) or other critical components such as process air, dehumidification, mold spore mitigation or moisture/mold resistant cleanroom walls. I am designing and building In Delaware for myself and others with the intent of Net Plus meaning the facilities produce more than consume, are energy efficient and increase net profit. Great article and needed as these costs and realities are not covered enough. These numbers are not even close. Especially with the robust compliance hurtles that is widely spread now. Indoor facilities are closer to 300-400SQFT of production space. That gets you a facility, lobbying, corporate and admin, cost of operation to solvency, and state licensing and taxes. It might cost $75 sqft in your moms basement. Hi John – please message me at [email protected]. I’d really like to learn more about your project. I’m looking to get my commercial grow license in oklahoma once the 778 state bill gets passed. Is there any advice or initial costs I should be aware of? We have good temperature and fertile ground during grow season, I was considering outdoor grow. Any advice? Oklahoma will not allow outdoor commercial grows. New rules just saw it. Must have a roof and biometric locks. Roof can be retractable. Must have foundation. Hello , I have 150,000 and I’m planning on moving to Colorado to start a commercial grow business.is that enough money to start on a small scale ? Let’s say a 2000sqf warehouse or do I need more capital? And I’m from Florida and I have a felony conviction for growing weed in the Florida state , will that be a problem for me in Colorado? Thank you . I’m on the same boat as you. If you find out before I do would you let me know? Indoor growing in an upcycled container will cost you less than $80,000 for a 40′ box with 300sqft of grow space.